The Brittany takes its name from a region in Northwestern France. A few favored Brittany names of French origin include Adele, Brie, Chanel, Noel, and Audry. 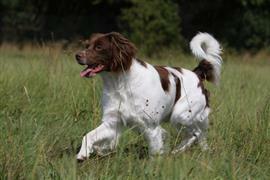 The breed comes in three coat colors: orange and white, black and white, and liver and white. Some favorite college related options for orange and white Brittany owners include Bevo (Texas Longhorn mascot), Clemson, and Smokey(Tennessee Volunteer mascot). Bear (Brown University mascot) and Hawk (LeHigh University mascot) are a couple of college inspired dog names more fitting for a puppy with a liver and white coat. Black and white Brittany owners have Friar (Providence College mascot) and Polar (Bowdoin College mascot) as mascot names inspired by colleges that don the same colors. Several interesting name ideas can be borrowed from famous American pioneers. Ezra, Darwin, Griffin, and Pierre are pioneer inspired names. Some of our pages will contain a subcategory. A subcategory is a slightly more specific grouping than the main topic of the page. For a subcategory, we will include a separated table of names and corresponding descriptions. An example of a subcategory of Red Dog Names would be 'Dog Names Inspired by Red Wines'. If you have any subcategory ideas for the Brittany Names page, we would love to hear them. Use the form below to submit your ideas.